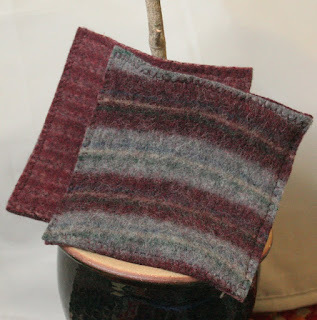 These are some potholders made from recycled wool sweaters. A couple of weeks ago my friend brought me a bunch of sweaters from Maine and I've been having good fun making things with them. I still haven't cut into that cashmere yet. Here's a list of what I make from the sweaters: potholders, treasure bags, mittens, hats, flowers, fingerless gloves, head bands, leg warmers, bags (purses, market bags, backpacks). I think there are other things I've used them for, but I can't think of them right now! It's a challenge to see just how much of a sweater I can use without wasting the fabric.